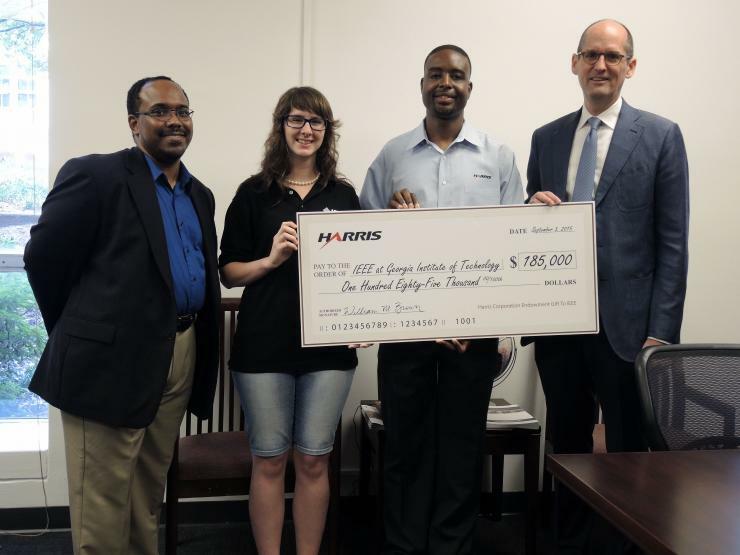 The Georgia Institute of Technology student branch of the Institute of Electrical and Electronics Engineers (IEEE) was presented with a $185,000 gift from the Harris Corporation on September 3, 2015. The Georgia Tech IEEE student branch, which is the largest in the country, receives a donation from Harris each year. This year, the company wanted to increase their commitment to the organization by providing a generous year-over-year endowment that will run in perpetuity. Harris, a communications and technology company, employs more than 700 electrical engineers worldwide, and many Georgia Tech alumni are a part of the Harris workforce. “We look forward to continuing our engagement with Georgia Tech students in an even more meaningful way and over the long-term. Many of the brightest minds we have on our team are alumni of Georgia Tech. We rely on both their foundational knowledge and creativity to solve our clients’ biggest challenges,” said William C. Majette, senior engineering manager in Space and Intelligence Systems at Harris Corporation. The endowment will benefit the more than 800 members of Georgia Tech’s IEEE student chapter by providing ongoing funds for competitions, workshops, and leadership and networking opportunities. “We are incredibly grateful for this opportunity and hope that the relationship we have built over the years with Harris Corporation will continue to flourish,” said Jenny Hunter, chair of the Georgia Tech IEEE student branch. In addition to the gift given to the IEEE student chapter, Harris has also donated $2 million to the School of Electrical and Computer Engineering (ECE) that will support the renovation of the Van Leer Building Rotunda into a multi-level, interdisciplinary makerspace. The project will break ground in fall 2016 and will be completed in 2017. Harris Corporation Presents Check to IEEE Student Branch. Pictured left to right: Elliott Moore, IEEE student branch advisor and associate professor in the School of Electrical and Computer Engineering; Jenny Hunter, chair of the Georgia Tech IEEE student branch; said William C. Majette, senior engineering manager in Space and Intelligence Systems at Harris Corporation, and Steve McLaughlin, Steve W. Chaddick School Chair.